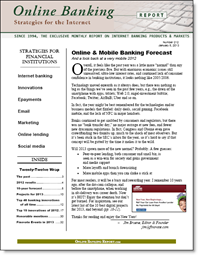 Our latest research is now available: Online Banking Report 2013 to 2022 Forecast. The report includes our latest 10-year online banking, mobile banking and bill-pay forecast for the U.S. market. Online banking remains relatively flat, growing less than 5%, while mobile expanded by 40% last year (see note 1). Based on recent mobile growth, we now project that in 2019, mobile account access will equal online account access in the United States (based on household penetration of each service). The report also includes a revised 10-year forecast for U.S. peer-to-peer lending. After growing almost fifteen-fold in the past three years (2012 vs. 2009), we expect continued strong growth of nearly 30% compounded annually through 2022. Finally, we took one last look at 2012 and documented the top-10 innovations or trends of the year (see below). We also updated our top-10 project priorities for 2013. 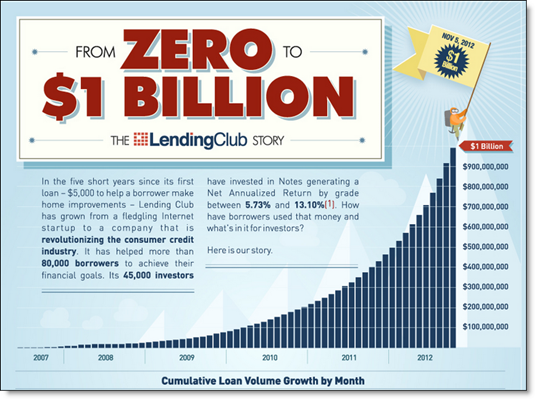 The company originated nearly three-quarter billion dollars in new loans in 2012 and surpassed $1 billion in cumulative originations in November.